Lancome has chosen to call their latest UV Expert GN-Shield sunscreen a “BB Base” because it is slightly tinted. I will save my comments about BB Creams for another post (and I do have a LOT to say about it) so lets just concentrate on how the Lancome BB Base performs. The Lancome BB Base is quite essentially a tinted sunscreen. The SPF 50 PA+++ rating makes it good enough to wear on its own without having to first apply sunscreen and the tint is enough to even out skin tone. It is light coverage so your skin tone is more even but it does not cover scars, marks or blemishes. It would help if you apply it thicker. I find that it performs well enough for a tinted sunscreen. I have worn it on its own with a dusting of pressed powder (I used the MAC Mineralized Skin Finish Natural powder) and a touch of Guerlain Meteorites. My skin does take on a pretty smooth look that is at once natural yet better than the real thing. 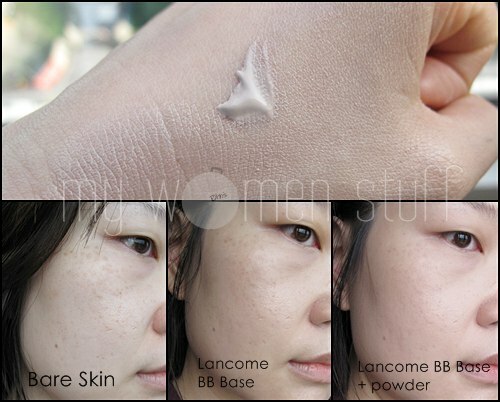 You could also pair this BB Base with the new Lancome Mineral powder which is quite pigmented. I haven’t quite tried it on my face, so I don’t know how well it plays together but I’m assured that used together, you get a luminous glow to your skin that is quite lovely. If you prefer higher coverage, you can use 2 way foundation powder over it as I sometimes do. It does not make me too oily but do bear in mind that I have dry skin and whilst I can get shiny around mid day, I don’t turn into an oil slick. I also have not used the Lancome UV Expert sunscreen so I cannot compare the performance of the tinted and non tinted version. The Lancome BB Base only comes in 1 colour – a strange grey-pink. On lighter skintones, you should have no problems with a colour match – I don’t once its sheered out and this does not oxidise on me. However I must say that this BB Base should only be used by those with Light-Medium colouring. If you are dark skinned or very tanned or very warm, you might find it leaving a grey or slightly pink cast on your skin. If you want a more dewy finish, apply the BB Base immediately over your moisturizer, before the latter is fully absorbed into your skin. Used this way, those with slightly darker skin tones might also be able to get away with using this base. I’ve shown a before and after picture collage above. You can see that the Lancome BB Base evens out the skin some. But once pressed powder (not foundation) goes on and a touch of Meteorites, its much more evened out. I cannot explain the pinkness – it could be lighting because in person its not so pink. That said, I pause at calling this new Lancome offering a “BB Cream” because BB creams are supposed to be more than just sunblock, moisturizer and foundation in one. Its supposed to help heal problem skin. Lancome makes none of those lofty claims. What it claims to do is to screen your skin against UVA and UVB rays and help even out skin tone. So, for me, calling it a BB Base is a bit of a misnomer. I personally do not find the Lancome BB Base sufficient for use as a moisturizer so there goes one of the functions of a BB cream/base. It performs well enough as sunscreen and fairly well as foundation (if you are the right colour and don’t mind light coverage) but above all, it performs best as a makeup base because I think it makes a good base for makeup. A 30ml tube retails at RM165. Am I a fan of the Lancome BB Base? I’d have to say I’m on the fence about this one. I like it for being a tinted sunscreen – it does what it says – protects me from the sun and gives me a good base for makeup and even replaces foundation on some days. On the other hand, I don’t like the whole BB Cream/base hype because I see this product more as a tinted sunscreen and I feel that is what it should be marketed as. My 2 cents. Disclosure: Featured product was a press preview sample provided by the company for consideration. For posting policies please read the disclaimer. PREVIOUS POST: Fitflop Pietra to flip flop my way in style! Too bad Lancome (and L’Oreal) sunscreens broke me out, so this BB cream probably would as well 🙁 It does look like a pretty good product though. i think your bare skin looked better than with this BB cream on. the setting powder was what made the difference. it diffused the pores for you. otherwise, i think this BB cream accentuated your pore size more. *_* i hope you don’t mind me saying so! i haven’t liked any of the BB cream i tried but i haven’t tried that many. i think TM is just enough for me. I hope the Westerners realize that they will merely be falling into a marketing ploy should they jump onto the Western BB Creams bandwagon. I am okay with BB creams, not using them, since I don’t use foundation, sticking to my sunscreen as makeup base for now. But of the samples I’ve tried, I really like Dr. Jart’s one. So I guess, they do work… … Really have to find the right one. haha. And according to Skin79, which has just entered Singapore, officially, they say as long as the cream suits your skin type, the colour and everything else should match and be nice! Not sure how true that is, because this Skin79 has 1001 types of cream to choose from. LOL. Did try a sample of Lancome’s UV Expert Sunscreen. Not bad! Kind of like L’oreal, but L’oreal broke me out, while Lancome didn’t. Strange. I’d love to see your opinions on BB Creams! Looking forward. I found the Lancome one better than the Loreal cos the latter made me oily in the day. I haven’t really had very good experiences with BB Cream or rather I didn’t experience the wonders the BB Creams were supposed to give but they certainly are popular here in Asia eh? Yes… we have a lot of Korean shows, and their actors/actresses always look fabulous… People can try more than 10 tubes, each costing some S$40-S$80. And the funny thing is, BB Creams are meant to be so minimally used that one can take a year to finish. West side a bit slow on this due to lack of Korean shows I guess. I see =) I only got a sample, was too little to tell if there really is a difference between L’oreal and Lancome, apart for Lancome not irritating my skin. Sounds like the costlier one is better afterall. Really? BB Creams are not meant to be slathered on? I tended to use them like moisturizer/sunscreen hehe… Thanks for sharing! Lol I find it funny that western brands are now jumping on the BB cream bandwagon. I guess they deliberatly put BB base on the tube to draw in Asian consumers who are into BB creams. I wonder if this is sold in the Western market as well, will have to check. i have a oily n blemish prone skin…juz wondering is this product suitable for me, oily or sticky? Thanks for the review. As for skin healing, I’d have to say it did wonders for me. 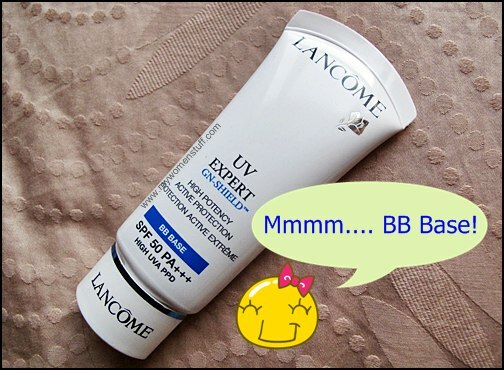 I have been using Lancome UV Expert Sunscreen and comparing this new BB Base sunscreen to the old one, this one feels much lighter. UV Expert Sunscreen was somewhat thick and heavy, and when my skin was breaking out, it made it worse. This new BB Base sunscreen – I have only used it for less than a week now, but my skin feels so much smoother and silkier. I’ve tried Hanskin (the original BB cream) but this lancome one works so much better when it comes to healing. However, it seems to be more transparent than other BB creams that I have used which means it offers less color to cover your blemishes. That i want compare Lancome and Dior which have spf50 and whitening function? Headache! Thx for sharing.I’m waiting review from this lancome gnshield sunscreen bc I want to gv this one try.Since Iam moving to jakarta from seoul,my skin gettin dull and breakout by blackhead..eeww.and as korean Iam huge fan of bb cream besides another skincae regimen.Ive been using the history of whoo seol whitening essence sunscreen and its my holy grail till Iam moving out to jkt. Does this sunscreen by lancome makes ur skin became greasy and oily after severak houra? This review was back in 2010 but I remember it being generally a little oily after a while. I personally swear by Shiseido Perfect UV now which is the best sunscreen I’ve used to date. My review on it is here. It was written back in 2012 but it’s now 2014 and I’m still using it!